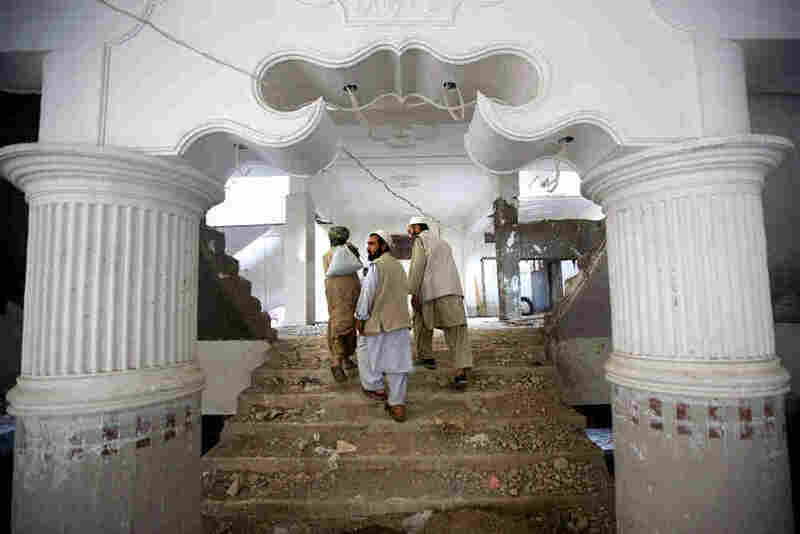 Rebuilding Afghanistan: Locals Want More Say Many Afghans complain that the United States and other donor countries are spending billions of dollars creating a hodgepodge of expensive and often shoddy relief and development projects in dangerous areas. A U.N. official says it's time to "let the kid drive," allowing Afghans to direct aid projects. Contractors walk through an apartment complex under construction in downtown Kandahar, Afghanistan, in April. Since 2002, international donors have pledged nearly $56 billion to build and develop Afghanistan, making it one of the largest recipients of foreign aid in the world. The United States is by far the largest donor. The U.S. ambassador, Karl Eikenberry, told Afghans in a speech last week that they can expect billions more from Americans in the coming year. "We will concentrate on agriculture and other key sectors of the economy, while reducing the pool of poor, unemployed men who are most vulnerable to the recruiters of extremism and militant violence," he said. Yet many Afghans are unmoved by such promises. They complain that international development amounts to a hodgepodge of expensive and often shoddy projects in dangerous areas with little local say over how the money is spent. On a hilltop in a Taliban-rife district north of the city of Kandahar, Army Capt. Max Hanlin talks with a group of American civilian workers about their impending visit to a small, mud-walled village below. It is a place these U.S. government workers have never visited. It's also new for them to be working with soldiers like Hanlin, whose battalion is on the front line in the war with the Taliban. Now that the militants have been cleared out of this part of Arghandab district, the civilians' aim is to move in quickly. They hope to win over villagers with offers of cash for work and other enticements — enticements the Americans pay for but want delivered by Afghan officials responsible for Arghandab. For example, the local district governor and Afghan soldiers hand out blankets to protect the locals from winter weather. "We want to engage the tribal elders with the government of Afghanistan. This is really at the district level where that occurs," says Brian Felakos, who works for the U.S. Agency for International Development. But making community development appear as an Afghan initiative is a hard concept for Afghans to grasp. Even for the local officials in Arghandab, whom these American civilians are looking to empower. Here, the district governor, Haji Abdul Jabar, tells village elders that it's the Americans — not Afghans — who are offering to pay them $6 a day to clean out canals and otherwise improve their community. The district governor gestures at Katya Sienkiewicz, manager of a U.S. government agricultural voucher program. The governor says he's embarrassed that foreign women do more for Afghanistan than Afghan men do. This view of Afghan helplessness has been nurtured by the West since the Taliban government was cast out eight years ago. "When all of the donors came back to Afghanistan in late 2001 and early 2002, they were all carrying big satchels full of money," says Mark Ward, an American who is the adviser on development to the United Nations' special envoy in Kabul. "And the fact that there was no government there to tell us what to do didn't really slow us down. And that's when we started getting into some bad habits." 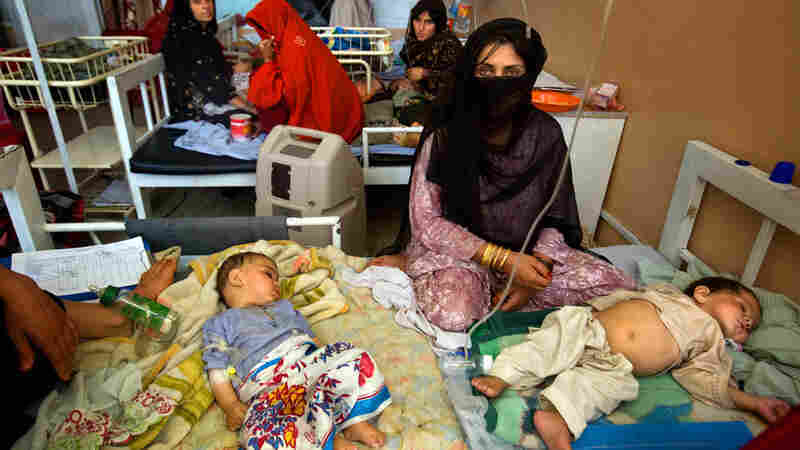 Ward and others say donors failed to ask the Afghan government to identify its development priorities. Or, donor countries have focused mainly on regions where their troops are based. The Americans, for example, spend much of their money in the eastern and southern provinces, Ward says. "But there are other parts of the country where the fight is not going on that have a real potential to grow the economy of this country." In the breadbaskets of central and northern Afghanistan, for instance, most farmers still can't get their goods to market. The vast natural resources needed to make Afghanistan self-sufficient also remain untapped, with no roads to get the minerals and gems out even if they are mined. "Think of the jobs for unemployed youth or even Taliban who need to be reintegrated into, you know, the basic economy of this country. That economic potential does not exist in the south and the east, where the fight is," Ward says. The focus on volatile areas means less money is getting to the Afghan people. It also promotes instability in peaceful areas as residents there grow restless over being ignored. Contractors — most of them Westerners — subcontract projects there several times down the line. Often, they hire Afghan vendors from other provinces, which is a major problem when it comes to quality, says Kandahar Gov. Tooryalai Wesa. "A person not from Kandahar, if the job is done, he's gone. He doesn't live here," Wesa says. "But if he's from Kandahar, he lives here. So everybody can [tell] him, 'This is wrong. You did the wrong job. You have to fix it.' "
Others complain that foreign contractors also end up having to spend huge sums to protect their projects — and not just on private security firms. One senior Afghan official in Kandahar told NPR that it is common practice for him and others awarded foreign-funded contracts to pay the Taliban and local warlords so they won't attack those projects. Lorenzo Delesgues, who heads Integrity Watch Afghanistan, a think tank based in Kabul, says one of its surveys concluded that no more than 40 cents of each dollar allocated for development was actually spent on development. "Today that figure might be even less, it might be 10 to 30 cents, because security expenses have grown," he says. Delesgues cites the recent $50 million project to refurbish the Kajaki dam, built by U.S. engineers more than a half-century ago in Helmand province, which is now a stronghold of the Taliban. The new project is aimed at generating 100 megawatts of power to residents of Kandahar and other major southern cities. Parts to run the Kajaki dam's giant turbines were brought in by helicopter because the roads leading to the heavily guarded dam were controlled by the Taliban. But the dam still only provides a third of the power that the U.S. Agency for International Development envisaged because the power lines can't be reached to be upgraded. Still, President Obama's plan for increased U.S. development in Afghanistan remains largely focused on the south. The number of American government workers there has increased nearly tenfold this year, even as the United Nations and foreign nongovernmental organizations have cut back their operations in the south because of violence and instability. Frank Ruggiero, the chief U.S. development officer in the south, is in charge of a seven-province region that is the most dangerous in the country. The idea, he says, is to hasten development and its handover to Afghans in pivotal population centers like greater Kandahar in hopes of persuading residents to side with the government rather than the Taliban. "Whenever we do reconstruction projects now, we do reconstruction projects based on what the Afghans want to do," Ruggiero says. "We're here to provide them space, to give them the assistance they need to create their own government. And as President Obama said, the Afghans always have to be in the lead." That's hardly the case now, says Ward, the U.N. adviser, adding that it's time to "let the kid drive." "We have spent millions and millions of dollars training them how to manage resources. How to design a project. How to execute a project. How to account for the money. How to report and monitor and do evaluations," he says. "But we don't give them the money to see if they've learned anything." So far, the donors seem unwilling to do so. Disappointing Afghan officials, a development conference next month is again being held abroad in London instead of in Kabul. Insiders say talk there will focus more on setting deadlines for the Afghan government to clean up corruption than on changing the way the West does development work in Afghanistan. The audio and an earlier Web version of this story incorrectly referred to Army Capt. Max Hynton. His name is Max Hanlin.